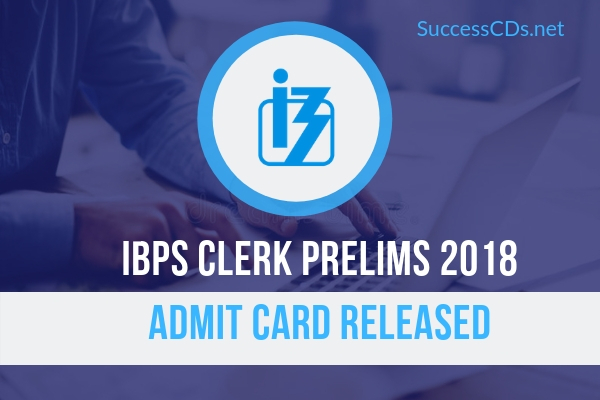 IBPS Clerk Admit Card 2018 - Institute of Banking Personnel Selection has released IBPS Clerk admit card 2018 for Preliminary exam to be held on December 08th, 09th, 15th, & 16th 2018. IBPS has invited application from the eligible candidates to fill 7275 Clerical Cadre (CRP Clerks -VIII) posts in different banks through IBPS Clerk 2019 Recruitment drive. Candidates who have successful submitted their application for the IBPS Clerk Recruitment 2018 would be able to download their Admit card from the official website www.ibps.in. Download and take a print of IBPS clerk Admit Card for future reference. The preliminary exam will be computer-based and will consist of 100 objective type questions for 100 marks. The exam will have three sections — Numerical ability (35 questions and 35 marks), English language (30 questions and 30 marks) and Reasoning ability (35 questions and 35 marks). Candidates will get 20 minutes for each section. For each wrong attempt, one fourth or 0.25 of the marks assigned to that question will be deducted.